The mess that happens during construction – ugh! Everything’s covered to reduce the post-construction clean up. There was sawdust everywhere! The joys of living in the city – no garage, no workshop. It’s all done in the home. We’ve talked about it for a long time. We’ve debated different options and ways to address the problem. We’ve made lists of pros and cons and researched everything there is to research. We had a few rough ideas for what we wanted to do, but hadn’t really nailed it down. Then it happened. Something broke. It had a crack in it before, but we were planning on a redo, so figured it could wait. It was functional and not a safety issue. Why not wait until after the holidays? And so began the Great Construction Project. Also known as: building a bedframe when you live in the city, and have no garage or workshop in which to build! Let me back up for a moment. Why did we build a bed rather than just repair the existing one? 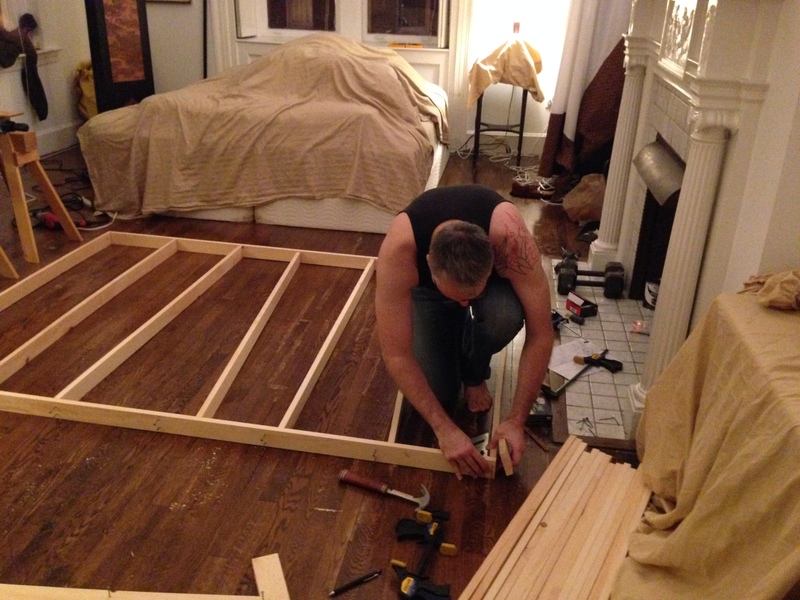 Well… my hubby is a tall man, very tall, and even on a king bed, his feet hang off the end. Sure, we could do a California King for a bit more length, but that meant a brand new bed anyway, and a whole set of challenges since no one on the East Coast sells Cal Kings. It also didn’t address the fact that what we really wanted was something… different. What we really wanted was a platform bed, at the height we chose, in kind of a floating style, where we could use baskets underneath for storage. What we were really attracted to were platform beds with a Japanese-style futon (note not the same thing as what most Americans think of as a futon!). But we wanted it bigger. We had some great ideas, but they were going to wait until after the holidays. And so, my hubby, Mr. Metro, got busy and a side of him that most people don’t know exists came out. See, Mr. Metro knows tools, and woodworking, and construction, and knows how to design and build something that’s going to work, and last, and look good doing it. And so, with two weeks left till the holidays, the main platform is built, the support mechanisms that allow us to adjust the height are in place, and the whole thing has been primed. The new all-cotton futon mattress is on the way. All that’s left is final cosmetics – framing in the support mechanisms so only smooth wood shows and painting everything. And getting bedding. And getting rid of the old bed.